There is an endless amount of advertising opportunities for digital marketers. On any given day it is easy to get pulled in 100 different directions and it’s just unlikely you can understand & manage it all. So, it is extremely important to choose the opportunities that give you the best exposure to ROI! Facebook certainly offers an unparalleled amount of exposure and, due to it’s options for specific targeting, a potentially terrific return on investment. Here are top reasons for why you should consider advertising on Facebook. Facebook has an enormous user base with 1.49 billion members worldwide and 22 billion ad clicks per year. With that size user base, it is guaranteed your customers are there. You just need to reach them! And, Facebook offers the resources and tools to help you do just that. A Facebook business page is free. However, it will NOT give you the reach with customers that you truly want and need unless you advertise. Luckily, the Facebook ads platform allows you to reach 1000’s of people per day at a very low cost. Now, of course, each type of ad opportunity has a particular purpose and they perform differently, but it is within the realm of possibility for any business to reach a couple thousand targeted consumers for $1 dollar per day. That’s affordable targeted advertising for any budget and a fraction of the cost of other online marketing opportunities. Daily budgets are possible too, so you are sure to never spend more than you can afford. Between the ability to target behaviors, interests, demographics, connections, ages, languages, locations, you name it, you can target a very detailed group of people, maximizing the odds that you are reaching an interested customer. You can really dig in deep and layer these targeting options. 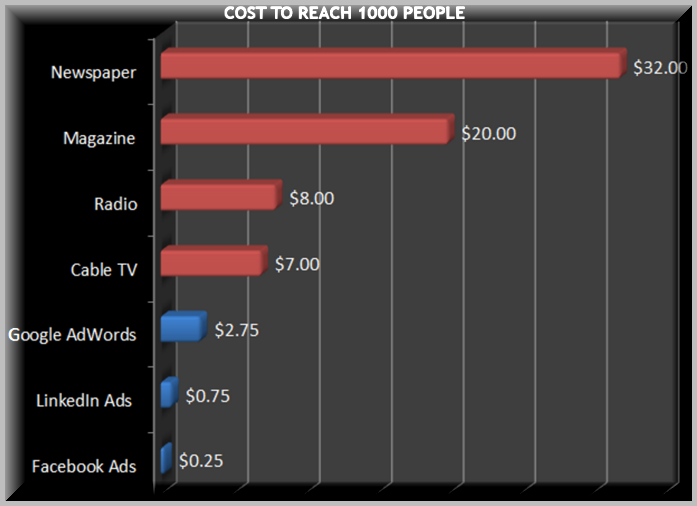 This is how you can effectively stretch your advertising dollars and maximize your ROI. Facebook offer you an amazing opportunity to create and target a custom audience made up of people that have already visited your site. In other words Facebook lets you market straight to your warm leads. This is an invaluable tool! Many times these customers just need one more push to be sent down the sales funnel. A well thought out, attention grabbing ad for your business while they are scrolling their Facebook fe ed is often that final push they need. Not literally, but close! Once you have been marketing on Facebook for some time and you have found your niche audience, Facebook allows you to clone them. This means using the “lookalike audience” option where you can market directly to a new audience that is similar to your high converting one and Facebook will find and deliver your ad to the lookalikes. With similar interests and demographics, etc, you are likely to be reaching interested customers. With limited hours in the day, and all of the directions your marketing plans can go, focusing on cost effective, high converting, good ROI opportunities are THE ONLY way to survive. With these and so many more reasons you should be advertising on Facebook, it almost seems silly not too. https://www.kineticknowledge.com/wp-content/uploads/2015/08/kinetic-knowledge-logo2.png 304 300 Kinetic Knowledge https://www.kineticknowledge.com/wp-content/uploads/2018/08/KKLogoDarker-1.png Kinetic Knowledge2015-11-04 23:01:392015-11-18 18:28:45Facebook Ads Are Cheap! How To Determine A PPC Advertising Budget? SEO Before Or After My New Website Build?